The Contributor | Has "Cover-Up General" William Barr Struck Again? Has "Cover-Up General" William Barr Struck Again? As attorney general, Barr—without showing us even a single complete sentence from the Mueller report—decided there are no crimes here. Just keep moving along. Barr’s history of doing just this sort of thing to help Republican presidents in legal crises explains why Trump brought him back in to head the Justice Department. Christmas day of 1992, the New York Times featured a screaming all-caps headline across the top of its front page: Attorney General Bill Barr had covered up evidence of crimes by Reagan and Bush in the Iran-Contra scandal. Earlier that week of Christmas, 1992, George H.W. Bush was on his way out of office. Bill Clinton had won the White House the month before, and in a few weeks would be sworn in as president. But Bush’s biggest concern wasn’t that he’d have to leave the White House to retire back to Connecticut, Maine, or Texas (where he had homes) but, rather, that he may end up embroiled even deeper in Iran-Contra and that his colleagues may face time in a federal prison after he left office. Independent Counsel Lawrence Walsh was closing in fast on him, and Bush’s private records, subpoenaed by the independent counsel’s office, were the key to it all. Walsh had been appointed independent counsel in 1986 to investigate the Iran-Contra activities of the Reagan administration and determine if crimes had been committed. Was the Iran-Contra criminal conspiracy limited, as Reagan and Bush insisted (and Reagan confessed on TV), to later years in the Reagan presidency, in response to a hostage-taking in Lebanon? Or had it started in the 1980 campaign with collusion with the Iranians, as the then-president of Iran asserted? Who knew what, and when? And what was George H.W. Bush’s role in it all? Walsh had zeroed in on documents that were in the possession of Reagan’s former defense secretary, Caspar Weinberger, who all the evidence showed was definitely in on the deal, and President Bush’s diary that could corroborate it. Elliott Abrams had already been convicted of withholding evidence from Congress, and he may have even more information, too, if it could be pried out of him before he went to prison. But Abrams was keeping mum, apparently anticipating a pardon. Weinberger, trying to avoid jail himself, was preparing to testify that Bush knew about it and even participated, and Walsh had already, based on information he’d obtained from the investigation into Weinberger, demanded that Bush turn over his diary from the campaign. He was also again hot on the trail of Abrams. So Bush called in his attorney general, Bill Barr, and asked his advice. Barr, along with Bush, was already up to his eyeballs in cover-ups of shady behavior by the Reagan administration. Safire ultimately came refer to Barr as “Coverup-General” in the midst of another scandal—one having to do with Bush selling weapons of mass destruction to Saddam Hussein—as the Attorney General was already covering up for Bush, Weinberger, and others from the Reagan administration. Now, just short of two months later, Bush was asking Barr for advice on how to avoid another very serious charge in the Iran-Contra crimes. How, he wanted to know, could they shut down Walsh’s investigation before Walsh’s lawyers got their hands on Bush’s diary? In April of 2001, safely distant from the swirl of D.C. politics, the University of Virginia’s Miller Center was compiling oral presidential histories, and interviewed Barr about his time as AG in the Bush White House. 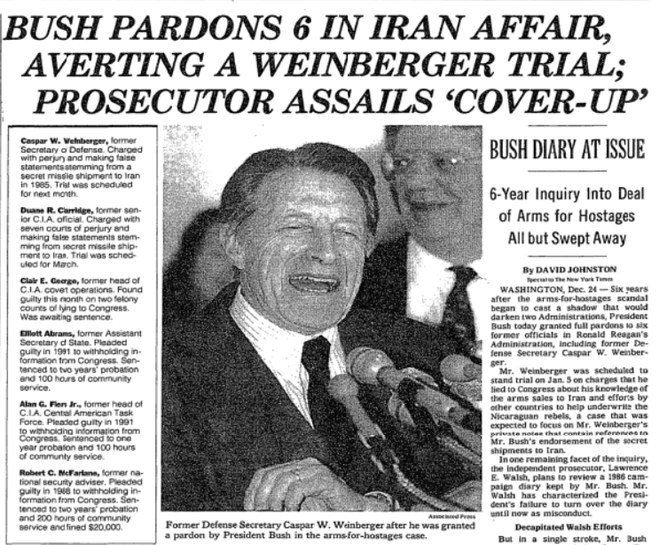 They brought up the issue of the Weinberger pardon, which put an end to the Iran-Contra investigation, and Barr’s involvement in it. Turns out, Barr was right in the middle of it. Which is exactly what Bush did, on Christmas Eve when most Americans were with family instead of watching the news. The holiday notwithstanding, the result was explosive. America knew that both Reagan and Bush were up to their necks in Iran-Contra, and Democrats had been talking about impeachment or worse. The independent counsel had already obtained one conviction, three guilty pleas, and two other individuals were lined up for prosecution. And Walsh was closing in fast on Bush himself. History shows that when a Republican president is in serious legal trouble, Bill Barr is the go-to guy. Safire accused Barr of not only rigging the cover-up, but of being one of the criminals who could be prosecuted. Earlier in Bush’s administration, Barr had succeeded in blocking the appointment of an investigator or independent counsel to look into Iraqgate, as Safire repeatedly documented in the Times. In December, Barr helped Bush block indictments from another independent counsel, Lawrence Walsh, and eliminated any risk that Reagan or George H.W. Bush would be held to account for Iran-Contra. Walsh, wrote Johnston for the Times on Christmas Eve, “plans to review a 1986 campaign diary kept by Mr. Bush.” The diary would be the smoking gun that would nail Bush to the scandal. And Walsh didn’t take it lying down. The phrase “highest ranking” officials included Reagan, Bush and Barr. Barr successfully covered up the involvement of two Republican presidents—Reagan and Bush—in two separate and perhaps impeachable “high crimes.” And months later, newly sworn-in President Clinton and the new Congress decided to put it all behind them and not pursue the matters any further. Now, by cherry-picking Mueller’s report and handing Trump the talking points he needed, Barr has done it again. The question this time is whether Congress will be as compliant as they were in 1993 and simply let it all go. Both Trump and senior Republican leadership are already calling for a repeat of ’93; what remains to be seen is if the press and Democratic leadership will go along like they did back then.